Studying with peers may raise your GPA. If you're a traditional undergraduate student, living on campus could be your first experience away from home. 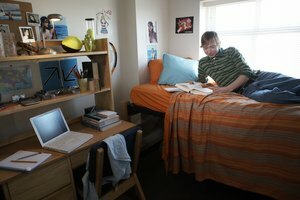 Kent State University crunched the numbers and found that, generally, students living on campus have higher grade point averages than those who don't. In the absence of your parents' or guardians' watchful eyes, whether living on campus raises your GPA depends on your ability to keep a strict schedule and manage your time. Being able to walk or bike short distances between lecture halls, dormitories and libraries makes keeping up with assignments a less tiring undertaking. The presence of campus security makes it possible to use facilities for extended hours. While being on campus doesn't guarantee a higher GPA, it may eliminate procrastination associated with the location of facilities. Being in a supportive community with a common goal may help raise your GPA. As a campus resident, you'll have the flexibility to study with tutors and peer groups day and night, while such opportunities may not be convenient or even possible if you commute to school. However, if you don't focus on making good grades, living on campus and spending more time socializing than studying could be as much of a hindrance to your GPA as it is a help. Most colleges furnish learning facilities with the latest technology needed to enhance the learning experience. Living on campus gives you around-the-clock access to the latest computers and lab equipment. You'll also have the high-speed Internet service you need to research projects and get them done in a timely manner, covered by the cost of your tuition. If you live off campus, you may be limited to the use of your personal computer and the quality and cost of Internet service available where you live may vary. You can still be a successful student with a high GPA even if you live off campus. Ideally, to make the most of your college experience, it's a good idea to rent a residence relatively close to campus and have reliable transportation. However, the financial stresses of maintaining your own home may distract you from your school work. So if you live off campus, rent an affordable place and consider paying for it with financial aid, which you are allowed to do. Keep your GPA up by maintaining frequent communication with your professors, academic adviser and classmates, especially those in your major. University of New Mexico: Why Live in the Residence Halls? Black, Maya. "Does Living on Campus Help a GPA?" Synonym, https://classroom.synonym.com/living-campus-gpa-6221.html. 26 September 2017.